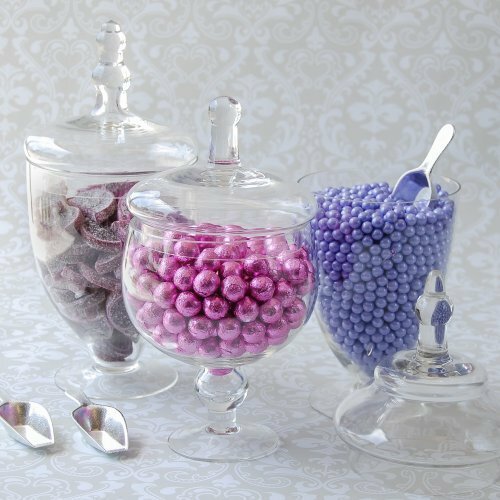 Stylish apothecary glass jars not only add elegance to your candy buffet, they also protect and keep the candy fresh during the reception. 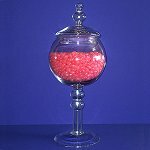 The see-through quality of glass offers an optimal visual effect for the display of the candies. 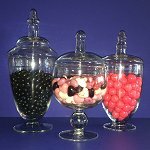 Experiment with the position of the glass jars on a table to evaluate the look of different combinations and reveals unique, interesting possibilities. 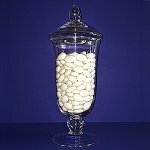 Creating a mirror effect with the glass jars is very appealing. 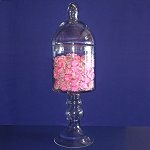 Select an impressive glass jar as the centrepiece, and work your way inside out by adding sets of two identical jars on each side of the centrepiece. For an awesome look, display an odd number of containers on your table. For the best in glass jars - here are our favourites! 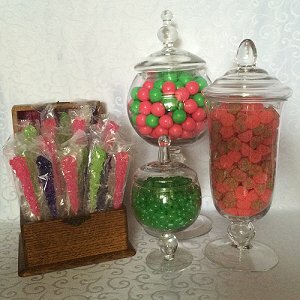 Height: 8½" - 9½" - 11"
Add a classy touch to your candy table with this set of 3 pedestal apothecary glass jars with lids. 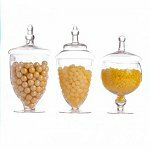 These gorgeous glass apothecary jars are sure to steal the show at your wedding reception regardless of what you put in them. They are elegantly designed in eye-catching styles and sizes with matching lids.